While on earth since his birth, Jesus stayed in unexpected places. The “carpenter’s son” stays in Nazareth, the holy family’s home. He still surprises, for he is still found in unexpected places. he still remains the itinerant preacher walking the highways and byways. Where does he stay? With you, with me, with whomever invites him to stay. What are your thoughts and prayers for this day? Is there a word, phrase, or verse from this Sunday’s readings or this poem which stands out for you? Please share it with us in the comments below. Please click on the icons below to share this poem with others. You touch my life with beauty and simplicity!!! I read tihs before going to my office today. It inspired me “to come and see ” Who would come to my office this day. Gia, let me know who comes to see you and where do you take them? 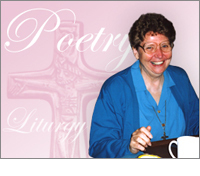 Mary, I am happy the poetry inspired you. I hope whoever visited your office was inspired by you. The word that got me thinking in this poem was “unexpected.” Many times in life I have been surprised to find Christ in places, situations, and people where I was not expecting to. I have learned that when I am expecting to find Christ in situations, places and people, I am never disappointed. In fact, my day is happier. This little insight has made me want to work on my expectations. Thanks, Juliemarie. Susan, thanks for renewing an old insight. Expecting Jesus anytime, anywhere, and with people makes life brings us the fulness of life that Jesus wants for each of us. Dear Angelstarspeaks, what a wonderful confirmation of my mission to spread the good news over all the mountains, hills and valleys of the world. Thank you. He had has no where to lay His Head!! Left on the Steets of India my twin brother and I had no where to lay our heads. Sick, dying of Humger, we were taken in by a orphanage. Dirt floors, no lights, little to eat or drink an unexpected place!! Today living in a subrub here in the United States I found Jesus and my home. I take Him everyday into the Hallways of my High School. As peacemaker accepting those who face difficulities and bullying embrcing them as Brother and friend!! After school I take him to rest home where I work! A smile, a kind word, serving meals that nourish their bodies, I try to nourish their hearts and souls with kindness and compassion. I can honestly say never a day that I do not take Jesus to at least one of my classmates or clients. I too am restless and called to have Jesus take up and rest deep in my heart!!! Reggie, what a wonderful witness story. Spread the word. Take someone new with you on your trips of mercy and love. This can be a way to “pay it forward.” Thank you for sharing. May your example be a prophetic witness to all of God’s goodness and provident care.